Please note we are unable to ship this product to Northern Ireland and the Channel Islands. Made extremely affordable by their simpler design. The Bronze series safes offer a level of security that matches the legislation in many Countries or States. Again they are constructed of folded or full seem welded steel. They are available in varying steel thickness. The doors are stiffened with additional steel. The locks are 7 levers as well and operate a double bolted lock. Some models have two locks fitted for additional protection. Carpet is added to the floor and many models feature the ammunition storage. Rubber moulded racks keep your firearms neat and protected from damage. 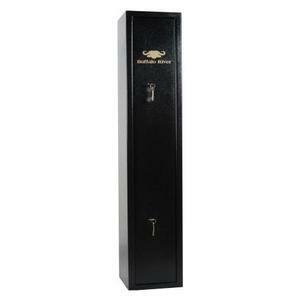 Gun safes/cabinets are not held in stock, but are delivered direct to the consumer from the manufacturer. The manufacturers will always endeavor to contact the consumer before dispatch to ensure that someone is at home to receive delivery. Please be aware that couriers are not insured to carry items into your house so please be sure to have help available in the form of a responsible person in case required as carriers reserve the right to charge for a second delivery. Great cabinet, I've currently got 5x scoped pcp, 2x scoped spring &amp; 1x unscoped spring air rifles &amp; there's still room for at least 1 more scoped rifle. Handy extra shelf for accessories &amp; a lockable internal ammo cabinet.